Waterhouse Lake, located South of the Bancroft Airport, is a beautiful body of water, untouched by the urban environment. This private beach was the prime location for a beautiful retirement home, with a full time vacation experience. The dream is to build a beautiful single family dwelling, designed to be a relaxing environment for the retired couple entering their golden years. 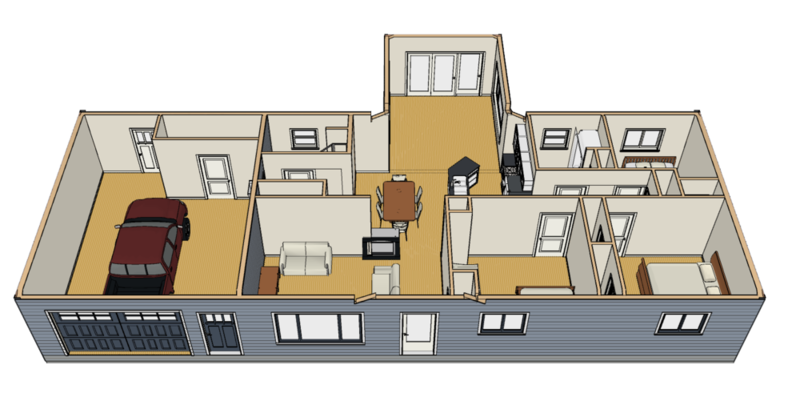 The building has to have an open concept, full size interior doors, have a look and feel inspired by the beautiful outdoors, and have affordable running costs. To meet the needs of the clients to the fullest, Beacon chose various design strategies that would accommodate a natural looking home. The first decision was to install a pine wall and ceiling  inside the breakfast nook. This provided a natural feel, and a cottage like appeal. Around the central located gas fireplace  a solid, live edge, mantle made from northern white pine, was handcrafted to match accompanying trims. Inside the breakfast nook, bedrooms, and dining rooms, beautiful ornate wood ceiling fans were installed to compliment the design schema. To keep the home affordable, Beacon setup in-floor radiant heating , and passive heating through window placement. Each window in the home was measured and designed to allow optimal sun light during the winter time. Meanwhile the roof overhangs were setup in a manner that the high sun of a hot summer day, was blocked, keeping the house cooler. Pine ceiling in the breakfast nook with ornate wood ceiling fan. Centrally located, two sided fireplace with handcrafted northern whit pine. 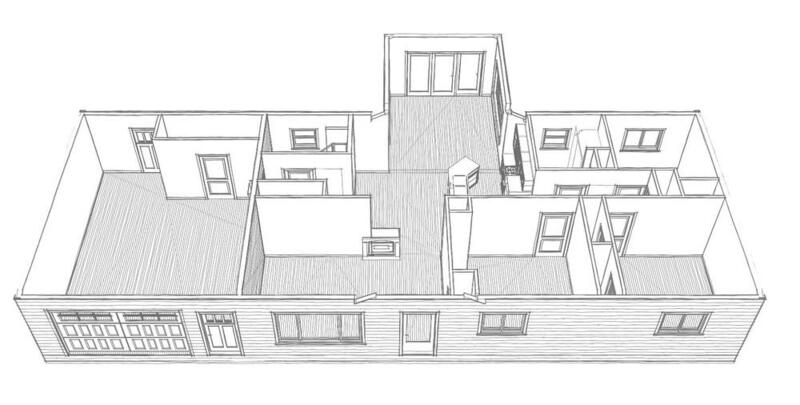 The Build Plan: A single family dwelling, 1600 foot slab on grade, attached garage, 3 bedrooms, 2 full baths, breakfast nook, eat in kitchen, living room, in floor radiant heat, central gas fireplace. The vacation home is to be completed by end of fall same year. The build time totaled 200 hours and spanned over the spring and summer seasons. Initial assessments of budget and running costs were maintained. The production of the Waterhouse lake property was one of the best jobs of its season. It is a modern designed economical home with an interior that brings the outside in. The pine ceiling and ornate wood fans display the beauty of the North Hastings Region. 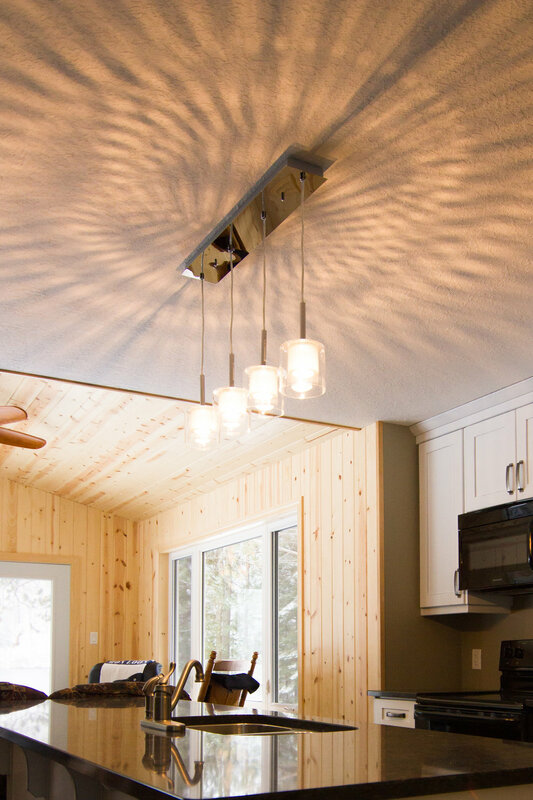 Paired with the handcrafted white pine fireplace, and the breakfast nook, this vacation home is one of a kind on Waterhouse lake. The stunning interior design and expert craftsmanship is a testament to Beacon's quality of work and consistent performance on the job site.